Thanks to Jessica Rivelli, the Founder and CEO of Working Women of Tampa Bay for the weekly feature on That Business Show – Working Women Wednesdays! Today I featured two more amazing professional women from our community as well as heard from Jessica at the top of the hour. Yvonne Fry was on the first half of the show. 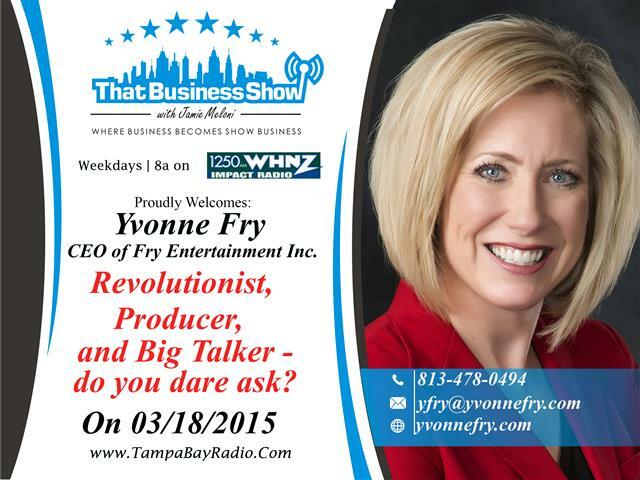 Yvonne chairs the Florida and Hillsborough Commissions on the Status of Women as well as CEO of Fry Entertainment where she manages talent and produces a variety of projects including commercials, PSAs, TV series and stage shows. Yvonne also serves as President of Lines of Communication which services medium and large corporations as well as many non-profit and government agencies with audits, design, and management of communication and network services. Yvonne was in studio today to discuss the upcoming Women’s Day at the Capital and the 2015 Florida Women’s Hall of Fame Induction Ceremony being held March 24th in Tallahassee. Yvonne also spoke to us about the involvement of the commissions in our community as well as touched on equal pay for women in the workplace. Learn more about these events and about Yvonne by emailing her at yfry@yvonnefry.com or phone at 813-478-0494. Visit her website at http://www.yvonnefry.com! 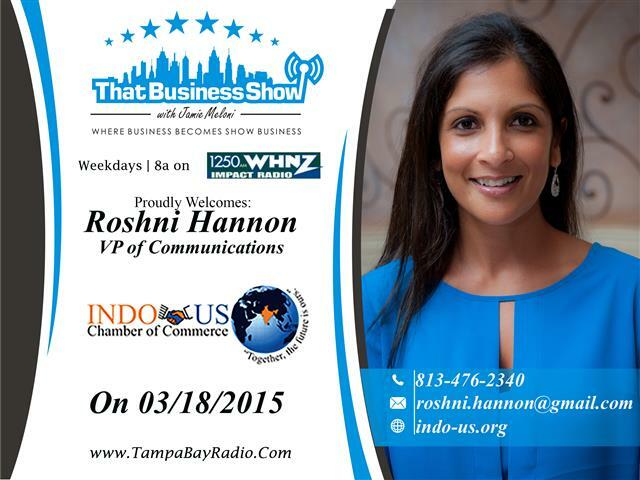 On the 2nd half of the show, I had the pleasure of speaking with Roshni Hannon. Roshni is a young professional that was most recently the Executive Producer of the Emmy Award winning and #1 rated morning news show in Tampa Bay on Fox 13. Roshni spoke of her transition from journalism into entrepreneurship as she works now as a story-architect with Mad Bear Productions, a company designed to help businesses create a brand via story telling on video. In addition to working with Mad Bear Productions, Roshni also serves as the VP of Communications with the Indo-US Chamber which is a free to join networking group that is actively involved in helping the community and connecting professionals from across the bay. Learn more about Mad Bear productions at http://www.madbearproductions.com and how to get involved in the US-Indo Chamber at http://www.indo-us.org. You can also reach Roshni for more information at 813-476-2340 or email at roshni.hannon@gmail.com!